Tuesday was my Sweeties birthday. I surprised him with a trip into the city after work. The plan was a fun, whimsical evening and just as she always does, Seattle delivered exactly what I had in mind. 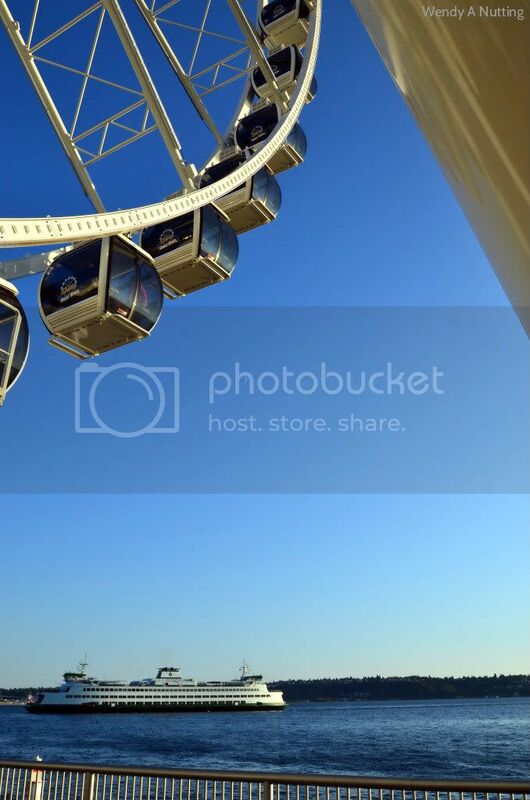 The Seattle Great Wheel opened June 29th and at 175ft tall, it boasts it's the tallest Ferris Wheel on the west coast. For those of you who need it, each car is has a panic button that will get you back on the ground in case of an emergency. This was such a fun night, the weather was perfect, one of the employees asked if anyone was celebrating a special event and then he coordinated, about 80 strangers to sing, "Happy Birthday" while we waited in line. After a beautiful ride we enjoyed a lovely dinner, al fresco, at Elliott's Oyster House and then Clyde found a Skee-Ball game. I swear the boy can sniff them out within a 25 mile radius. He loves to play and the arcade on Pier 57 had the one that spits out tickets! I thought the boy was gonna burst he was so happy! We ended the night late, with a set of plastic dice, 1 scary temporary tattoo and a gold tone metal ring. which Clyde happily presented to me in front of the 19ish year old "PRIZE" employee; who gleefully shared in his exuberance. It was a great Tuesday Birthday! Seattle Great Wheel Birthday Adventure from WA Nutting on Vimeo.